Since we will be using many native plants in our garden I thought it might be helpful to provide information on plants that would do well in our Chester County, PA location. This will be the first of many posts on the subject. So stay tuned! Campanuala rotundifolia (Bluebell, Bluebells of Scotland, Harebell) is a perennial growing up to 12″ with a 12″ spread. Blue-violet in color it requires sun to partial shade. The bloom time can be late spring into early fall and it is hardy in zones 3-9. It can be propagated by dividing the rootball or from seed. It is drought tolerant. It is attractive to butterflies, bees and birds. Monarda didyma – L (Scarlet Beebalm) is a perennial growing up to 3′ by 1’8″. It is hardy to zone 4 and is not frost tender. It requires sun or partial sun and is easy to grow. It is deer resistant and drought tolerant. It has a pleasant fragrance and is propagated by seed or division. This plant blooms summer into fall and attracts both butterflies and bees. Asclepias tuberosa (Butterfly weed) is a tough, drought tolerent native which is hardy in zones 3-9. It reaches a height of up to 24″ and has a spread of 24″. Bright orange in color it blooms from mid to late summer. As a herbaceous perennial it dies back in winter and re-sprouts each spring. It does well in a sunny, dry spot but can tolerate average to moist soil. It attracts butterflies It is also deer resistant. It will self sow which makes it important to deadhead if you don’t want volunteers. Propagation is done by seeding or division. Aquilegia canadensis L.(Eastern Columbine) is a hardy native perennial found throughout the eastern half of the US and it grows in a variety of soil and light conditions, although it does best in partial shade to filtered sunlight. It blooms in the late spring and its red and yellow flowers are attractive to butterflies and hummingbirds. Foliage consists of blue-green leaves growing at the base of the plant and along the stems. It grows up to 3′ and is propagated through seeding. It is hardy in zones 2-9. 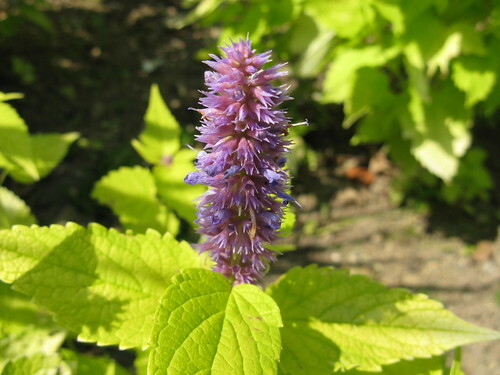 Agastache foeniculum, (Blue giant hyssop, Anise hyssop) is an upright growing perennial which has lavender to purple flowers which densely cover cylindrical spikes. The bloom time is mid through late summer. The foliage has an aromatic anise scent which attracts pollinators such as butterflies and hummingbirds. They grow from 2-4′ and spread from 18-36″. They are easy to grow and can tolerate dry to medium moisture but they require good soil drainage. They do best in full sun. Additional bloom is encouraged when the spent blossoms are deadheaded. This entry was posted in Native Plants, Perennials and tagged bluebells of scotland, butterflies and bees, butterfly weed. Bookmark the permalink.